When you visit Guatemala, you may run into images of an intriguing folk saint who, to some tourists, is known as the “god of smoking and drinking.” Maximón is depicted in European dress with trousers, shirt and hat. You’ll find him seated with a cigar in his mouth or an opening where alcohol can be poured. Not the usual saintly image! When our folk art tour group enjoyed lunch at a second story cafe overlooking the market in Chichicastenango, we started talking with another English-speaking group. They had recently visited a shrine to this Mayan god in the lakeside town of Santiago Atitlan and urged us to go. They said it would be an interesting experience and added that the god/saint apparently liked Christmas lights. We had Santiago Atitlan on our schedule and so we knew we’d have the opportunity to meet this mysterious figure. But who is he? 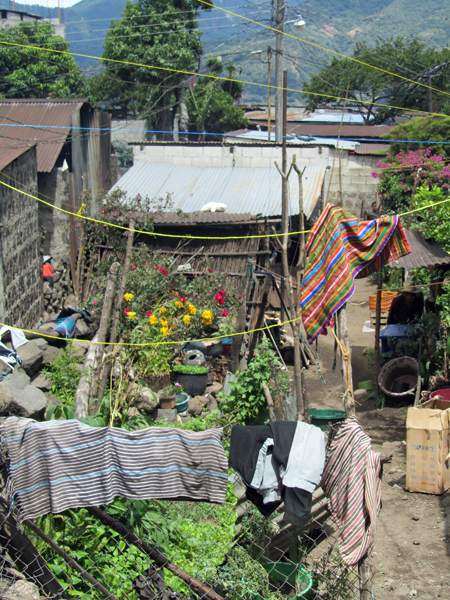 We found out that he is a rather important tradition in the Western Guatemalan highlands. 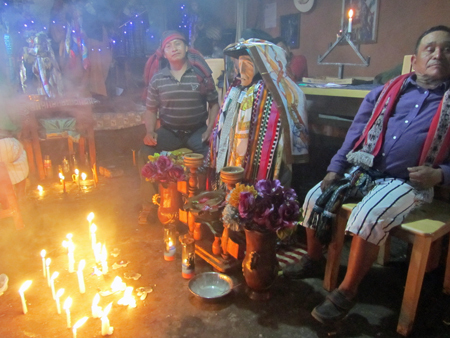 We learned, traveling village to village, that Mayan traditions are inter-linked and blended with Catholic traditions. Just skimming the surface of Mayan religion, of which there are many varieties, I’ve seen references to the pre-Columbian god Mam as a possible foundation for the Maximón beliefs..
Wikipedia quotes a story that explains why Maximón is portrayed as a short, seated man without arms. The story goes… one day while the village men were off working in the fields, Maximón slept with all of their wives. When they returned, they became so enraged they cut off his arms and legs. Somehow he became a god following this. Or, perhaps he was possessed by the god. The Maximón image is housed in a different home each year. Sometimes the family is chosen for their ability to fund celebrations and sometimes, like this year, the family was chosen because of their devotion to Maximón. 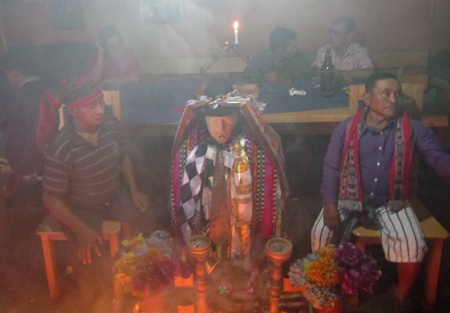 The family creates a shrine and provides Maximón with adequate liquor and tobacco during his stay. Shamans gather and pray. Offerings are made by the devoted and tourists pay approximately a dollar to take photos. The family takes the funds and uses them for a large event such as Easter. Sheltering Maximón can be very expensive. By now we were totally intrigued. We had settled into our rooms at the beautiful Hotel Atitlan resort. We had breakfast and met our Guatemalan-Mayan guide, Sara, at the boat dock in preparation for the short trip across the lake to the Tzutuhil Mayan community of Santiago Atitlan. The villagers are known for their textiles and devotion to Maximón. We arrived and walked up the dock and through the cobblestone streets with our guide, Sara. She turned into a very small walkway between homes. We felt as though we were walking through the residents’ outdoor rooms. There was laundry being done outside, cooking and carpentry. Children scurried along the path. Chickens pecked in the dust. As we reached the top of the little hill of homes, we smelled smoke, incense and heard chanting. A restaurant-size cooler filled with Gallo beer was outside the entrance to the room where we were to find Maximón. Over the doorway, garlic plants were placed in rows. We felt we were being taken into a place where tourists should not tread… but in reality we were welcomed (as were our monetary offerings). Our small group lined up in front of a saintly effigy in repose. Christmas lights decorated the glass case and flickered in the smoky room. It was late morning and things were well underway in this small room. 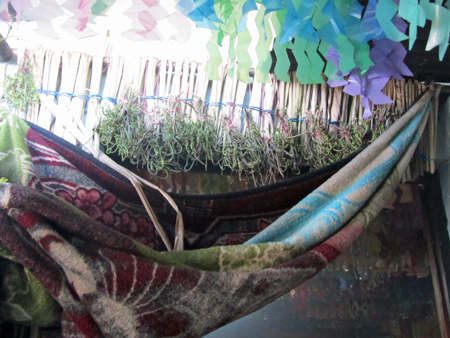 In the center of the room was the infamous Maximón… dressed in a suit with a hat and adorned with colorful scarves. He had a cigar in his mouth. He was flanked by two men, probably members of his Cofradia, or religious society. 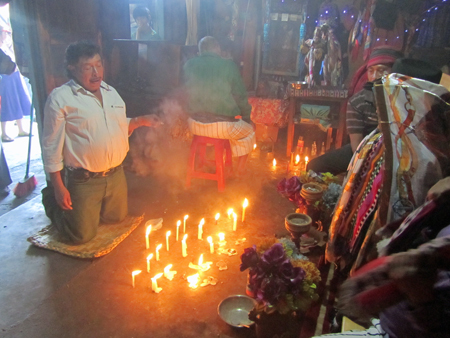 In front of him a shaman kneeled, swinging incense and chain-smoking. Behind Maximón was a table where three men smoked and drank the Gallo beer. Off to the side, other shamans prayed. It was an eerie experience. We made our monetary offerings to Maximón and took a few photos. It was hard to take in all that was going on. One of our group had to leave as she felt the energy in the room to be overpowering. The visit wasn’t all serious. As the shaman smoked, chanted and filled the room with incense, he abruptly stopped… pulling a cell phone out of his pocket to take a call. We tried to control our smiles as we were suddenly brought back to modern times. As we left, I felt that this was serious business for the worshippers. Maximón was not a kindly sort. He had a dark side, and represented a link with the underworld. I felt as though the shamans were appeasing him, keeping him plied with liquor and tobacco. Of course the best way to find out where Maximón is being housed in Santiago Atitlan is to go with a Mayan guide as we did. But if you do not have that luxury, you can ask a Tuk-Tuk driver to take you. There are several villages in the area that have Maximón shrines. We even found a shrine in the historic town of Antigua, conveniently located in the folk art shop, Nim Pot. Look for the shrine in the back near the little refreshment court. Beer is sold there of course. And, you can purchase your very own Maximón figure at the shop. This experience was part of a Guatemala tour organized by Joan Griffith of Wildwood Art Cafe in Austin, Texas and guided by area expert, Florencio Moreno. Find out more on the Authentic Presence website.